"Is it not lawful for me to do as I will with mine own? Is thine eye evil, because I am good?!?" 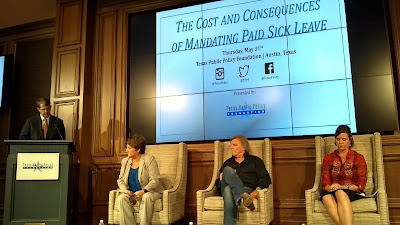 We attended this afternoon's TPPF event: The Cost and Consequences of Mandating Paid Sick Leave. The event discussed the municipal entitlement the Austin City Council invented out of thin air last February. Since Austin passed its ordinance, the tentacles are spreading to San Antonio and Dallas. Tina Greider-Cannon of the Austin Chamber discussed how there were only 19 days between posting the language of the ordinance and final passage. That schedule made it impossible to do a real economic impact study. Cannon furthermore illustrated how, even using the advocates bogus numbers, there was still going to be a net economic impact of at least $140 million. She also mentioned that unionized businesses are carved out of the ordinance. Don "Skeeter" Miller of the County Line restaurant called the Austin entitlement an "administrative nightmare." To simply consolidate the hours of employees who work at stores both inside and outside the city limits is a daunting task. He also said it would kill their ability to do flexible scheduling for employees. Miller said the minimum cost of the Austin ordinance would be $200,000 per year. Annie Spilman of the National Federation of Independent Businesses made an interesting point about the vagueness of the ordinance. She suggested it could set employers up for "stings" by various outside groups. Rather than fight a city working in cahoots with the outside groups, employers natural tendency will be to settle. Obviously, this is another form of shakedown. The most interesting speaker was Paul Workman. Workman talked about how the Austin ordinance was part of a national effort to push socialist economic policies at the local level. Workman pointed out that this was part of a trend along with several other bad city of Austin policies. This was the most perceptive we've seen Workman speak about the groups pushing this nonsense, and we were glad to see it. Of course, the problem is that this is not our first rodeo with Paul Workman. Paul Workman has been filing bills to reign in the city of Austin for years. Those bills never seem to go anywhere. We asked Workman about that during Q&A. Workman said that because of the new speaker, those bills will start moving. Of course, this brings up certain obvious questions about Workman's previous speaker decisions. But, at this point, dwelling on the past won't accomplish anything moving forward. Bottom Line: Municipal entitlements are a nightmare for any number of reasons.